Coffeeneuring means different things to different people. Sometimes it's a well-earned coffee after an epic ride; sometimes it's much simpler. The Saturday before this Coffeeneuring ride, I rode the Mercer Island-Redmond-Orting-MI 200K route with a couple of my riding buddies. This is not normally considered a challenging route, but the difficulty factor was increased somewhat by Mother Nature. The final two hours or so of the ride were in a massive windstorm that hit the Seattle area. The last 12 miles around the south end of Mercer Island was especially "entertaining" as we dodged the small limbs falling from the trees. Since there was no time for a Coffeeneuring ride on Saturday, I felt compelled to ride on Sunday. After the SIR annual meeting, Kasia and I drove to Woodinville for two of our favorite activities: she shopped at Molbak's, and I rode my bike. Luckily, one of my favorite coffee stops (The Commons in Woodinville) is an easy (FLAT!) ride from the downtown area. It was the perfect prescription for a simple Coffeeneuring ride. The day was surprisingly dry, and I even saw a little sunshine peeking through the clouds. 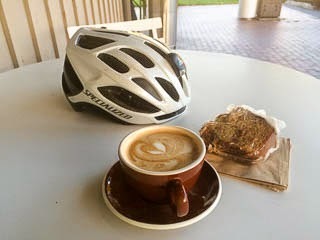 A relaxed ride, a delicious latte, and yummy coffee cake. It's hard to go wrong with that combination.